If you are feeling the heat of the weather thanks to the early arrival of the summers, well this is only the beginning of what is said to be a sweltering time ahead. While you may have summer clothes, summer decor and more, have you given a thought to how you can prep your body for the summer? Well if you have not, here are some summer workouts that will help you beat the heat! 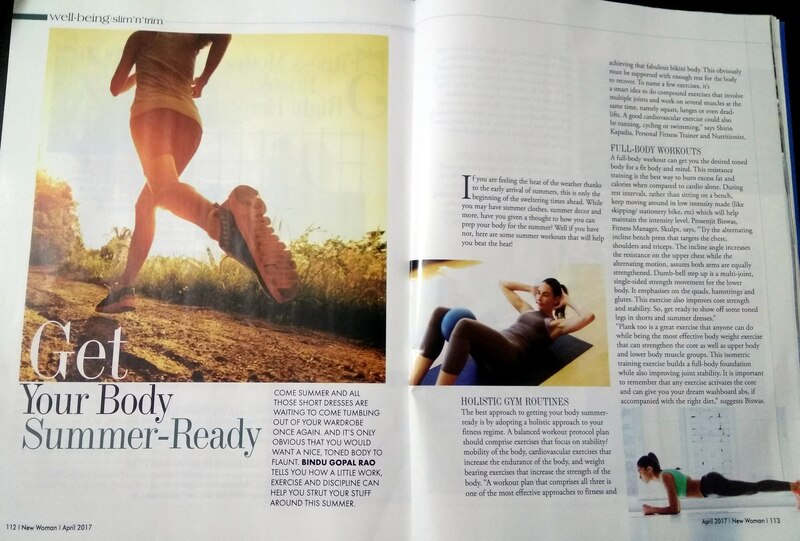 The best approach to getting your body summer ready is by giving a holistic approach to your fitness regime. A balanced workout protocol plan should comprise of exercises that focus on stability/mobility of the body, cardiovascular exercises that increase the endurance of the body, and weight bearing exercises that increase the strength of the body. “A workout plan that comprises of all three is one of the most effective approaches to fitness and achieving that fabulous bikini body. This obviously must be supported with enough rest for the body to recover. To name a few exercises, it’s a smart idea to do compound exercises that involve multiple joints and work on several muscles at the same, namely Squats, Lunges or even dead-lifts. 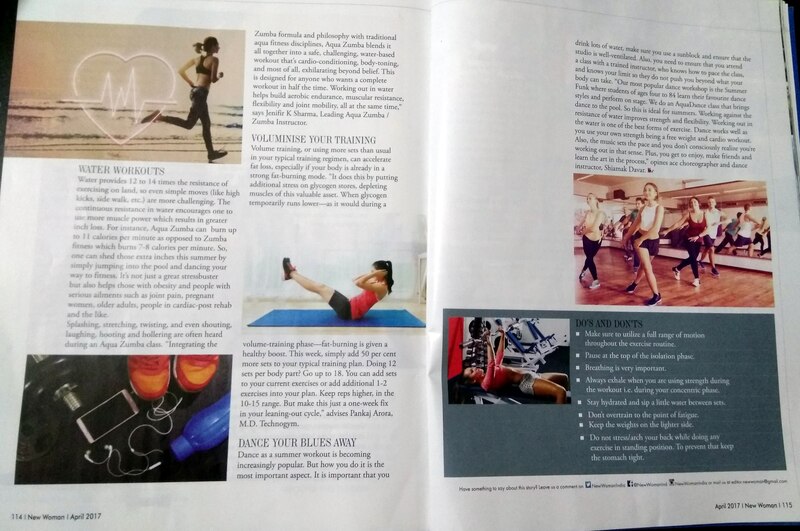 A good cardiovascular exercise could be running, cycling or swimming,” says Shirin Kapadia, Personal Fitness Trainer and Nutritionist. Water provides 12 to 14 times the resistance of exercising on land, so even simple moves (like high kicks, side walk etc.) are more challenging. The continuous resistance in water encourages one to use more muscle power which results in greater inch loss. Aqua Zumba has the capacity to burn 11 calories per minute as opposed to Zumba fitness which is 7 -8 calories per minute. One can simply shed those extra inches this summer by simply jumping into the pool and dancing your way to fitness. It’s not only a great stress buster but helps those with obesity and people with serious ailments like joint pain, pregnant woman, older adults, people in cardiac-post rehab and the like. Aqua Zumba, is also known as a Zumba “pool party,” and is an ideal workout especially during the heat of summer. Aqua Zumba gives new meaning to the idea of an invigorating workout. Splashing, stretching, twisting, and even shouting, laughing, hooting and hollering are often heard during an Aqua Zumba class. “Integrating the Zumba formula and philosophy with traditional aqua fitness disciplines, Aqua Zumba blends it all together into a safe, challenging, water-based workout that’s cardio-conditioning, body-toning, and most of all, exhilarating beyond belief. As far as health perks is concerned, this is a stupendous form of workout and the program has been designed keeping in mind people who might not be able to do regular Zumba fitness class and yet provide them the chance to feel the Zumba workout experience, this time in water! This is designed for anyone who wants to get a complete workout in half the time. 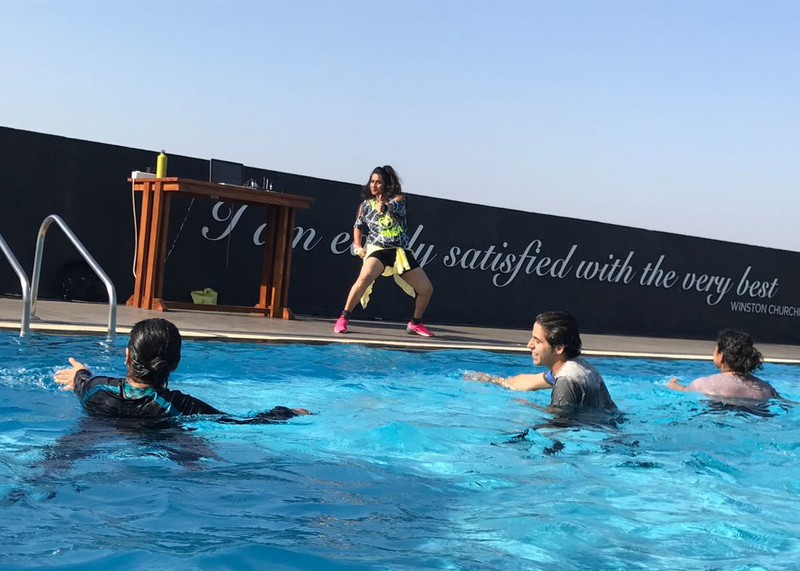 By working out in the water with Aqua Zumba, one works on aerobic endurance, muscular resistance, flexibility and joint mobility, all at the same time,” says Jenifir K Sharma, Leading Aqua Zumba/Zumba Instructor. Volume training, or using more sets than usual in your typical training regimen, can accelerate fat loss, especially if your body is already in a strong fat-burning mode. “It does this by putting additional stress on glycogen stores, depleting muscles of this valuable asset. When glycogen temporarily runs lower—as it would during a volume-training phase—fat-burning is given a healthy boost. This week, simply add 50% more sets to your typical training plan. Doing 12 sets per body part? Go up to 18. You can add sets to your current exercises or add additional 1-2 exercises into your plan. Keep reps higher, in the 10-15 range. But make this just a one-week fix in your leaning-out cycle,” advices Pankaj Arora, M.D. Technogym. Dance as a summer workout is increasingly becoming popular. While working out in the summers, you have to be very careful and always stay hydrated. Dance or sport, they’re great forms of work out but how you do it is the most essential. You have drink lots of water, make sure you use a sunblock and ensure that the studio is well ventilated. Also, you need to ensure that class you attend has a trained instructor who knows how to pace the class and knows your limit so they do not push you beyond what your body can take. “Our most popular dance workshop is the Summer Funk where students of ages four to eighty four learn their favourite dance styles and perform on stage. Dance and summers have been synonymous for nearly three decades since Summer Funk started! So for me Vitamin D is Dance, whether it is for kids, teens, adults or the young at heart! Also, the best thing about summers is swimming. We do an AquaDance class that brings dance to the pool. So this is ideal for the summers. Working against the resistance of water improves strength and flexibility. Working out in the water is one of the best forms of exercise. Dance works well as you use your own strength being a free weight and cardio workout. Also, the music sets the pace and you don’t consciously realize you’re working out in that sense. Plus, you get to enjoy, make friends and learn the art in the process,” opines Shiamak Davar Founder and Artistic Director. Make sure to utilize a full range of motion throughout the exercise routine. Pause at the top of the isolation phase. Always exhale when you are using strength during the workout i.e. during your concentric phase. Stay hydrated and sip a little water between sets. Don’t over train or fatigue. Keep the weights on the lighter side. Do not stress/ arch your back while doing any exercise in standing position. To prevent that keep the stomach tight. Previous Previous post: How to be friends and business partners at the same time?